Hola to all of you guys. 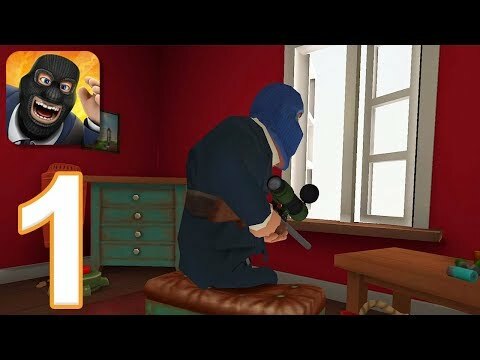 I am here today to present you another great and funny game called Snipers vs Thieves published and created by Play stack. This is a fast-paced game where you can play with strangers or with friends. Either play as the sniper and be a lone wolf or play with up to four friends and play as a band of thieves trying to escape with the loot. As the sniper, it is your responsibility to take down the thieves before they reach the getaway van on the other side of the map. The thieves can be taken down either by shooting them as they sneak around or, if the sniper delays them long enough and time runs out, the remaining thieves who haven’t died or escaped will be arrested. As one of the thieves, use your environment to safely get to the van with your loot. Hide behind buildings and cars, use barrels and boxes to sneak across the map like it’s Metal Gear Solid. If the thieves can reach the getaway van without dying and before the time runs out, the loot will be split between them. If someone dies along the way, their loot can be picked up by another thief and added to the total at the end. How difficult it is to get to the van depends on how skilled of a sneaker you are as well as the skill of the sniper in the game, giving Snipers Vs. Thieves a good level of unpredictability. And now it is time for the gameplay. Let`s see what we have here. On the main screen of the game, you will be able to choose sides. For Snipers, there’s the office button. This is where the leaderboard can be found, as well as updating your profile (coming soon), and masks. Your character can have a variety of masks from collections like the “comfortably warm collection” which is ski masks in different colors, to the “oddball collection”, where if you want a giant eyeball for a mask, you can get it. In the Black Market, players can find the masks to buy as well as better scopes for the rifles, health kits, and other items. The items change every 24 hours, giving a nice level of variety and adding to the replayability of the game. The more new stuff there is, the longer the game will stay interesting. It is very hard for me to place a con on a fun game. You know me! At the end of this review, all I can say is that is one fun game.